Kelly Maynard (MSc. ERM, SIRM,) Experienced over 20 years in the field of Insurance and Financial Services with a background of Risk Management & Engineering. Kelly’s responsibilities required her to utilise Enterprise Risk Management (ERM) for the controlling of risk and for seizing business opportunities for Corporate’s, Brokers, P & C Insurers and OEM’s. 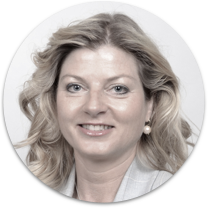 Co-writer of the Dutch VRKI norm, the current standard for Dutch Insurers and Security sector, Kelly was previously Head of the Risk Engineering team of AEGON, a leading Dutch insurer and is a former board member for the Dutch Certification Association SKG, ASPO and BCM Platform. She was also Development director & Risk manager for Polygon Group and has served as an Operational Director at a Global Loss- Adjusters Firm to transform traditional business units trough digitalisation.